Here is the compilation of Mozambican 45s I promised. A number of the tracks are by Fany Pfumo, widely acknowledged as one of the most influencial marrabenta performers. Marrabenta is a style of dance music associated with Maputo, the capital of Mozambique. The name was derived from arrabentar - meaning to break - in the local venacular. 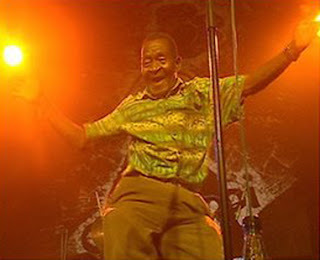 The earliest international bands exposing this style to international audiences were Eyuphuru and Orchestra Marrabenta Star de Mozambique. Once again, great stuff. The sound quality is surprisingly good given it was digitized from cassette. I was wondering if the recording information (labels, reference nos. etc) is available? John..the singles belonged to a friend of mine who had been on holiday in Maputo in 1990. She had bought the entire stock of the shop and had them lying around her apartment in Yeovil, Johannesburg. I took them all to my place and listened and taped the ones I thought were the pick of the bunch. Only now I wish I had made her an offer. Hindsight is a wonderful thing. Thanks, Matt. Another excellent compilation of tunes and artists that are completely new to me but will certainly be on the radar from now on. It expired so fast, a couple of days !!!! Is there a possibility it will be downloadable again ???? I've been listening to this one pretty much continuously since you first posted it and it's been growing on me in surprising ways. Since Mozambique is such a large counrty it's understandable that there would be numerous musical styles. What I found interesting about this collection is that, apart from a couple of tracks, there's not much that is clearly "lusophone." A couple of tunes are clearly in a South African language (Shangaan?) or one closely related, while others sound like they could be by Oliver Mutukudzi. It would be nice if some record company could get ahold of the master tapes and do this anthology up proper. Thanks once again for making it available. The quality of the music more than makes up for the minor sound faults. Matt, I know it says LIMITED LIMITED LIMITED, but I'm coming to the party late and would dearly love another crack at those Mozambican singles. Is there any chance they can go up again at some point? Pretty please?